Benjamin West, a gifted and talented Colonial American portrait painter, decided to leave the “New World” in order to complete his artistic education in the “Old World”. As a expatriate artist living in London, West realized that his inspiration to become a painter wasn’t going to be found in England though. West attributes his gaze being directed toward Art to his mother. “A kiss from my mother made me a painter.” What do you think West meant by this statement? Your thoughts? I think that Benjamin West was lucky to have had support from his mother. Lots of parents do not want the “life of an artist” for their children. It seems like a lot of these artists that we study let down their parents by not following in the family business. Having positive influences while forming your worldview and being surrounded by individuals who can help you shape your artistic style gives you a head start in life. Knowing you can pursue whatever you want to do lets you take chances, so you can truly be what you want to be. A support system is good, but in the end the only person you must impress to be happy is yourself. West must have assumed that the great masterpieces came from the old world… he would recieve the best education and inspiration by heading there to study. During his stay he must have come to the realization that what originally inspired him to become an artist was still behind in the old world. With that acknowledgment he probably understood that studying abroad could only him so far in the art world. The statement “A kiss from my mother made me a painter” I would interpret as the previous commenter did. That his inspiration and encourager was his mother and a kiss was the final acceptance of his path in life. I agree with Kristy Asato. I also think what Benjamin West meant by his statement, “A kiss from my mother made me a painter,” is that the support and blessing from his mother inspired him to go for what he loves to do and take all the risks and chances to be a successful painter. I think it was great that West decided to go back to the roots, the “Old World”, and complete his “artistic education.” There are such great masterpieces created in the “Old World,” such as Leonardo da Vinci’s Mona Lisa, that could be used to draw inspiration from and that is what, I think, Benjamin West was looking for. A kiss from his mother showed him her love and appreciation of his taking up painting. He felt blessed by her giving him permission to pursue his profession as a portrait painter. When I read his quote, I immediately thought about how mothers love everything that their child does. This truth for Watts was what must have led him to the realization that his own art, art which was true to himself and which would ultimately make him happy was the only thing that he needed. Its like that old story where the student is sent on a journey by his master to learn what would greatly be his final lesson that would entitle him to surpass his master, only to find that in the end, the “journey” was realization that what he was looking for was already inside of him all along. I believe that Watts knew that he was a brilliant painter simply because he believed that he was, and that although his education no matter where it be, was helpful, his inspiration, creativity and passion could not be taught. Benjamin West simply means that his inspiration is his mother. Looking to further his education in arts by traveling to the old world lead him to this powerful realization. Some artist have a strong driving force that propels them to create; Benjamin West is fortunate to draw inspiration from someone who has been there most of his life. “A kiss from my mother made me a painter” is a very tender quote by Benjamin West. It is interesting to me that he would attribute his identity as a painted to his mother. It is not common to come across quotes by artists sharing any kind of credit or glory for their work on skills. His mother must have been a huge if not the most important inspiration in his life. He basically calls his mother the force that drove him toward art. He must have had a very special relationship with his mother. The love and support of a mother would encourage any artist to embrace his or her calling as a creator of art. The fact that he acknowledges his mother’s impact on his life shows how the work of artists is more than products but an expression of their lives. This tells me that great artists show more than just paint and skills on their canvas. They communicate inspiration and passion. A kiss from your mother is normally a farewell and approval. I think of when i say good bye to my mother and all she can do is kiss me and sent me off. She knows that what ever i choose to do will be the right choice. Me knowing that, makes me wanna do the right choice. So i feel that her approval sent him off with a relief that she was ok with his decisions. Knowing that your mother is behind you pushes you to follow and strive on your goals. Maybe she didn’t really kiss him but its more of an analogy, that was the cherry on top of the ice cream, its what seal the deal and what made him a painter. 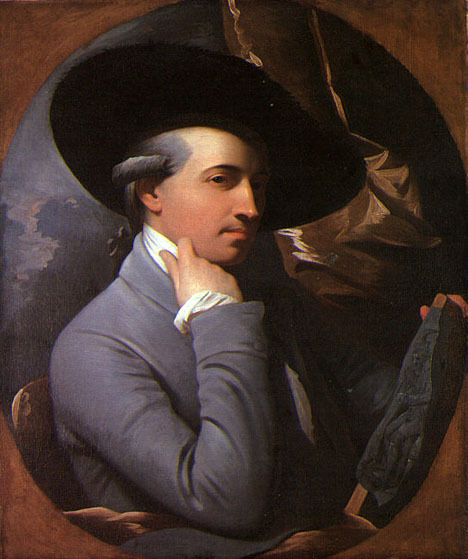 When Benjamin West states “A kiss from my mother made me a painter” he purely means that his mother was his inspiration. The kiss signifies her blessing to her son to let him do whatever makes him happy, in this case becoming a painter. West believes that without his mother’s blessing and inspiration he would not have succeeded as an artist. I dont see it as purely an approval but rather an acceptance. We all have in us who we are, so did he. His mother happened to be more responsive to his dreams and wishes that are within. He was formally trained as a painter by the native americans in color mixing and other as apprentice. His mother might have seen all leading up to this and let him free like a bird from a nest. I feel it is the mother letting him go witch made him the painter he was not the mother being accepting of his life. West was a talented painter. When he left the “New Wolrd” for England he was looking to find a new source of inspiration. He most likely came to a realization of what his true motivating force was once there, his mother. West went on to be successful in England and was commissioned by the royal family at the time. For him, throughout his success found comfort in the thought of his mother maybe. I think it might be a possibility that since West was raised in the New World the social class and cast system of the old world didn’t follow. It allowed his family to be more supporting and encouraging of being an artist and to live without the fear of being judged as much (at least compared to the Old World). These ideas were passed down to him through his family and being encouraged (as most people have said) by his mother is what helped him continue his pursuit. I agree with the comments above that having approval from your mother back in those days was a big thing. Parents always wanted their children to do bigger and better things in life and being an artist was not included in that. Even though he went to study abroad and received great training, there is no better inspiration than people that love and support you. Clearly he wasnt getting that kind of support in England. His mom wanted him to be happy and she supported him in what he was doing, which is what he needed to become a great artist. I think that West was saying that his mother instilled a love of the art’s in him and he was lucky to have that. Many parents in Colonial America would not encourage their son to a trade which might not be so supportive, economically. That fact that his mother now only gave him the love of painting but actively encouraged him is amazing. In England, he was faced with a whole new arena (one he was definitely not used to), but he didn’t get the same support in England that he did in America. Old World Art was different and had a lot more rules. West needed to travel there to find where he really belonged. When Benjamin West said, “A kiss from my mother made me a painter,” I believe he meant that with his mother’s love and approval, he became an artist. There are lots of parents out there that would rather their children do something like becoming a doctor, lawyer etc, than to become an artist. It is always good when the people around you approve and support you with what you choose to do. West’s mother’s encouragement is probably what helped him be such a great artist. I believe Benjamin West must had felt he couldn’t be as good a painter if he didn’t have his mother’s blessing. With her approval he painted with confidence and inspiration that made him want to go and study more in England as to get a better understanding of painting. West had an approval of being an artist from his mother that so many other artists didn’t have coming from wealthy families. So to have approval of being in the artworld definitely makes art that much enjoyable to share with everybody, which Benjamin West I’m sure must have felt when painting. For me that quote meant that he had his mothers support. To get support as an artist back then from parents or any family was a huge deal. Because for the most part, many artist did not make a living off of their work and still don’t. Art is a struggle as a career and to get support with something that you are good at that you believe in is a dream. I’m sure his mother was happy she made the decision to support her son considering how important he became in the art world. ”A kiss from my mother made me a painter.” Somehow I see “mother” as his motherland, which is the “New World”, because he could not find the inspiration he needed to become a painter he wanted in the Old World, England. However, from his series of paintings depicting the love between a mother and a child, I believe he embraced the selfless love and support from his mother and that alone was able to assist to what he wanted to become. When I read this post i knew that everybodies answer was going to be the same… And it was. Till I got to yours and it made me go back to the quote by west and reread it and I would say that I like thinking that when he said “mother” he was thinking of his motherland and that being the “New World.” I meanits great that his mother approved of what he did and encouraged him, but I think it’s more powerful when he is influenced by America and that he is a successful American painter. He had to go to the old world to see the strength he had gained from his homeland. I’ve noticed that many people took the quote very literal, “A kiss from my mother made me a painter.” People described their views on the relationship an individual has with a mother figure and how it may be significant to an artist such as West. Personally, I interpreted it more metaphorically. Instead of looking at it as a reference towards his birth mother, I saw it as him referring mother as the “New World.” Because he realized that his inspiration to become a painter wasn’t going to be found in England, he realized where he came from Colonial America, is where he’d find his true inspiration and influence for his art as well as him as an artist. It was the “kiss” from Colonial America which truly made him a painter and he certainly wasn’t going to find that anywhere else. West could be meaning two things, a physical or a symbolic approval. His mother may have approved, encouraged, and guided him to be an artist and to express himself creatively through portraiture. Or, she was symbolically his inspiration and a muse for him to pursue whichever path he felt was right. Either way, West had a solid foundation for creating the masterpieces he did. The fact that he refers to this blessing as “a kiss from my mother” means that she clearly had a deep love for her son. When a mother kisses her child she is showing them love which is not only an amazing affection to show, but it is also a great lesson to learn. I think that similarily Benjamin West’s mother taught him what being an artist was really about. I have had the same experience with my grandmother. She has taught me so much when it comes to life and how to live it. But she has also been my inspiration for being an artist. I believe West feels that in leaving his home and family behind he realized that he left what inspired him to become a painted in the first place. While it was important for him to expand his education in the arts, it was also important for him to remember why he decided to pursue a career in painting and that no matter how skilled or trained an artist is, it is the inspiration in doing the project that really makes the art as good as it can get. Parents have a way of giving children their blessing. I think west was talking about having the approval of his mother. A parent’s support can go a long way. In reality West needed his mother’s blessing in order to leave his home in Pennsylvania to study art. I admire West’s courage to travel the distance in order to obtain an education. It is amazing to see the influence of Europe on West’s work. In Agrippina Landing at Brundisium with the Ashes of Germanicus, you can see elements of Rome, and ancient Greece. This paining has such a classic feel to it that it is undeniable to see what elements of Europe West was able to take in and make his own. They say if you want to be a great artist, replicate the classics. Perhaps West is attributing his success to the support and blessing of his mother. For if it were not her support she gave him to travel to Europe to receive an artistic education, perhaps he would not have had the ability to be considered one of America’s finest artists?